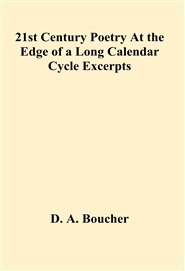 21st Century Poetry, At the Edge of a Long Calendar Cycle, Excerpts, 20 Poems by, D. A. Boucher, is a collection of Poems about life on Planet Earth between January First and December Twenty-second, 2012; December Twenty-first being the predicted end of the, Mayan Long Calendar. This is a Chapbook about the days leading up to that momentous day. The complete collection, 21st Century Poetry, At the Edge of a Long Calendar Cycle, contains 400 Poems. D. A. Boucher is the Poet Laureate of Lawrence, Massachusetts, U. S. N. A.